Explained in Flash. Years of bafflement, vanished. The killer Internet Phone just got better. Outrageously cheap landline calls from your computer, anyone? Hull – The fact that it rhymes with dull is no coincidence. 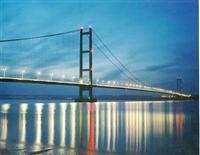 Saved only by the magnificence of the Humber Bridge (see right). Grimsby – As enticing as the name suggests. A constant and sometimes overpowering smell of fish hangs over the town, although the locals are oblivious after years of fishy assaults on their nasal passages. The M62 – The views in some parts are spectacular. The drivers in the area, however, are not. Leeds – Dark, but presumably only because I arrived late. Has not improved since the last visit, although the transvestite hitching a lift off the motorway was an interesting distraction. Work is going well, there’s no doubt about it. I’ve been in my new post for two and a half months, and suddenly Michelle and I are whisked up to The Belfry for a weekend of revelry – all paid by the company. How could we say no? It was knocking on the door of eight o’clock on a sunny Saturday morning, and Michelle and I were struggling to rise. The Company Weekend was starting in 5 hours – and the general idea was to turn up at a hotel, listen to the obligatory presentation, before setting about demolishing entirely free drink and food for the rest of the night. The thought if the upcoming fun spurred us on, and we arrived 200 miles away within 4 and a half hours. Speeding – us? The hotel is set in spectacular grounds, regularly used for the Ryder Cup, and we swung past the security into the hotel complex, suitably impressed. After mistaking the in-grounds nightclub for the hotel reception, we eventually booked in and made for the designated conference room. I’ve learned two things about corporate events. One is that they usually involve a bit of teamwork – and this was no exception. Split into our “teams”, we were told that for the next 2 hours we were to build and market a breakfast cereal, which we would present at dinner. This required unusally high brainpower for a Saturday afternoon, especially with the Managing Director on our team, but we eventually cobbled together a cereal (“Crackawhack”), a marketing strategy – revolving around pimps in playgrounds selling our highly addictive cereal – and a few posters. Oh, and a jingle, which I was informed I would sing later on that night. Oh joy. We retired, knackered, to our rooms a couple of hours later and waited for dinner. Little did I know how debauched the evening would turn. The clock struck six thirty, and we sat down to be met with wine. Well, it would be rude to resist, and the entire room was fairly sozzled by the time were due to conduct our presentation. Things degenerated into hazy chaos, as each team tried, and failed, to present their ideas. At one point, two managers managed to lose their inhibitions and most of their clothes as they danced around the tables. Michelle and Mark, my manager, decided to top off the night at the local nightclub, which was surprisingly impressive. Sloaney types strutted around, cheesy music blared out, and I managed to get away without buying a round for the rest of the night. At around 1am, we stumbled back to our room, leaving Mark and the rest of the funsters to dance into the night.